Tricia Serio, past winner of the WICB Mid Career Award for Excellence in Research. WICB has awards for scientists of all career stages. The Women in Cell Biology (WICB) Committee is an advocacy group for all ASCB members. It sponsors career development programs, career achievement awards, childcare grants for meeting attendance, career advice columns, and web-based resources, including a list of outstanding women scientist speakers that helps promote gender equality and diversity in the field of cell biology. The committee organizes career development programs, networking events, and award ceremonies. Year-round, members help identify topics for career advice (“Career Navigator”) columns in the ASCB Newsletter. 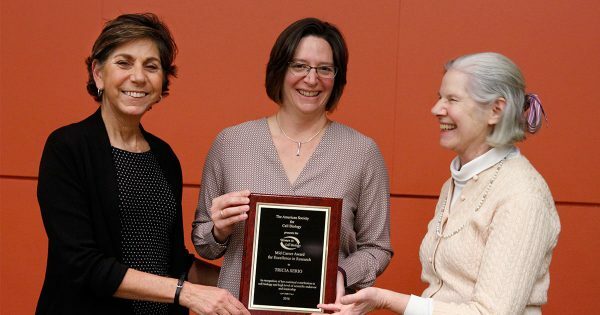 WICB provides an extensive list of speakers, categorized by research area, who have won major awards, given Symposium talks at ASCB meetings, or who have organized Minisymposia in their respective research areas, to facilitate the process of choosing women as conference invitees or panel reviewers. We welcome volunteers to lead roundtables on a broad range of topics, including Jobs in Biotech, How to Negotiate, Dual Career issues, etc. This event provides roundtable discussions on issues of importance to cell biologists in various stages of their careers. It has proven to be an excellent way to disseminate practical information on career choices, to discuss strategies for effectively developing a career, and to network with others who share career interests and concerns. Conversations are moderated by individuals who have experience in various professional areas or with particular issues. Childcare awards, supported by Springer Nature Publishing Group, allow many more junior faculty, postdocs, and grad students who are parents to attend than would otherwise be able to. Satire and humor are used to highlight inept solutions to problems that scientists face: effective self-promotion, developing self-esteem, dealing with funding problems, publishing, negotiating for a job, and feeling overwhelmed. After the performance, there is a Q&A to identify effective strategies. We welcome suggestions for topics and authors for columns. These articles from 1996 to present serve as a superb source of mentoring information. The WICB Network is an alliance of ASCB members who wish to learn about, support, and perhaps participate in our various activities and initiatives. WICB Network members receive periodic emails highlighting articles related to career/life issues. If you would like to receive periodic emails from the WICB Network, please sign up here. WICB Network hosts a social event for members at the ASCB/EMBO meeting. Members of the WICB Network and people interested in learning more about the network and the committee’s activities–and meeting one another–are cordially invited to attend the WICB Network Reception at the ASCB/EMBO Meeting. Please see the program for more details. Committee membership is open to all ASCB members. All committee members join as Associate members for one or two years, with full membership contingent upon chair and Executive Committee approval. Full members serve three-year terms renewable once. Members participate in conference calls throughout the year, in a committee meeting at the ASCB/EMBO Meeting, and in WICB-organized events during the meeting. Subcommittees that organize events are active through email and conference calls during the year. Members and Associates are expected to attend WICB-organized events.